Read this if you think you have sleep apnea. This month my heart doctor insisted I go through a sleep study to determine if I have sleep apnea. Sleep apnea is a condition which occurs as you get into a very deep sleep. The soft tissue in the back of your throat closes of your airway and you actually stop breathing for a period of time. The brain catches up and forces a "gasp" for air. Many people who snore have sleep apnea but that in itself is not an accurate symptom to determine the problem. Sleep apnea cheats the body of oxygen minute by minute, breath loss by breath loss until the oxygen levels in the blood drop to dangerous levels. This in turn forces the heart to work faster to move the blood through the body delivering oxygen to the brain. As this occurs blood pressure increases. I went to the clinic as prescribed and to my surprise I have this condition and have most likely had it for years. Over 2000 "events" were recorded by the computers wired up to all parts of my body. Around 3am in the morning the nurse on staff came into the room and placed a small nose mask on my face and started the CPAP machine which blew fresh air into my nose. I went back to sleep until 7am. 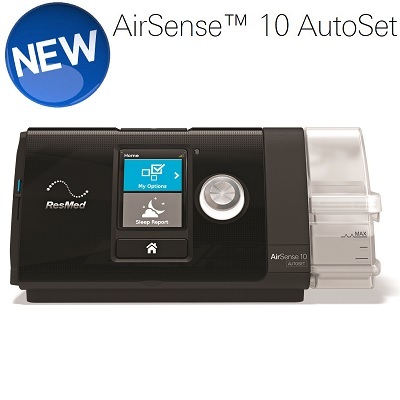 I met with the doctor to go over the results and he prescribed a home CPAP machine for me with predetermined airflow settings determined by the results of the study. I was skeptical but I trust my doctor. 2 days later I picked up my RES-MED 10 CPAP machine and the nose mask. Of course my wife laughed like hell when I put the mask on The machine has a water well to humidify the air and a heater to heat the air. I went to sleep that evening and surprisingly slept all through the night. My wife told me I didn't toss and turn like usual and the machine didn't bother her at all. Over a few days I reduced the airflow to lower settings and changed out the nose mask for a nostril pillow mask. The nostril pillow mask is much more comfy and completely silent. In short the machine is a wonderful device that if required will solve your apnea condition if you have it. Re: Read this if you think you have sleep apnea. Sleep apnea is much more common that many might think. it can happen to people at or near optimal weight, too. Some years ago, a dear friend of mine was tested and found he had it. He never had tonsils removed as a kid. His doctor recommended removing them to improve breathing during sleep. The doc also said that there were other health benefits without them. About a month after surgery, his doctor ordered another night of testing. The following morning, the monitors showed no abnormal night-time breathing patterns. And he does not need a machine or take meds. So FTS family, if you suspect sleep apnea, talk to your doctor about your tonsils (if you still have them). When I was overweight I would wake up gasping for air. This has not happened since I lost my weight, but I do snore. Welcome to the log-sawing club. But it's not so bad that it bothers my sleep. But before FTS, like you Susie, I had sleep apnea symptoms at night. Now, I just make good sound effects. I do have one problem for years that has never gone away. I have allergy attacks daily with these symptoms- I start out yawning, then my eyes water, then my nose runs. I continue to yawn over & over until I'm away from the source. As far as I know it's something in the air, my cat's dander and dust that trigger it. dust and mold kill me! I'm concerned about yawning over & over.